The destroyer Cassin Young (DD-793), now a museum ship in Charlestown Naval Yard in Boston, got hit by two Japanese kamikaze aircraft that killed a total of 23 crewmen. This ship history features many quotations from men who served aboard Cassin Young, both from interviews conducted by the author and from oral histories obtained from the National Parks Service at Charlestown Navy Yard. The author William J. Craig does not mention why he became interested in writing a history of the destroyer Cassin Young. The book includes over 30 black-and-white historical photographs and a 16-page insert of color photographs of the museum ship and exhibits. 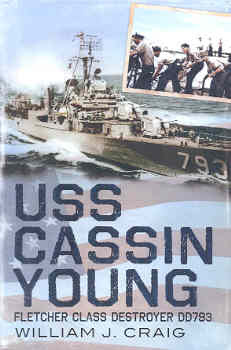 With the exception of Chapter 2 that describes life aboard a destroyer, the book’s six chapters provide a chronological history of Cassin Young. The third chapter, which describes the war in the Pacific and Cassin Young’s involvement in it, takes up more than a third of the book. Chapter 4 is devoted to the second kamikaze attack that took place on July 30, 1945. The next chapter tells how Cassin Young came out of retirement in September 1951 for the Korean War and continued in service until her decommissioning in April 1960. The final chapter briefly explains how Cassin Young became a museum ship in Boston. The six-page Epilogue, with its brief descriptions of what happened to Cassin Young crewmen after they left the destroyer, adds little to the ship’s history, since some entries are little more than dates of birth and death, marital status, and number of children. A complete bibliography lists the sources for this ship history, but there is no index to find specific topics. The writing in places needed a careful editing. For example, a photo caption states that 45 men were wounded in the first kamikaze attack that took place on April 12, 1945. Then the next page states that 59 crewmen got wounded in the attack without any explanation for the contradiction. A quotation from the commander of the radar picket destroyers at the top of page 52 describes the superb performance of Cassin Young during the Okinawa campaign, but this confusingly is introduced by the author as being related to the Saipan invasion. Examples of other errors include spelling Medway rather than Midway, 1945 rather than 1942 for when a crewman boarded before the destroyer's shakedown cruise, and Mount Saribachi on Iwo Jima rather than Mount Suribachi. In a few places such as the three-page description of Ulithi Atoll and the logistics service group that supplied American ships, the author seems to stray into background information that has little relevance to the destroyer Cassin Young’s history. There was a guy sitting there on the 40-mm. I figured he was dead, his name was Smith, and he was still sitting on the chair there. He had a life jacket on, and he had his helmet on and looked perfectly fine. And there didn't appear to be any marks on him, in the darkness. I got up real close and little fine pieces of shrapnel, like little needles, had blown into his head.... The plane had hit about 40 feet from the 5-inch, and it was about 30 feet from where this 40 mm was - 30-40 feet. And it blew up at an angle, and went in under his helmet; the right side of his face was puffed out a little, with pin holes. Then his life jacket had a bunch of these little slivers of steel gone through. You could see the kapok sticking out. And he's still sitting in the seat, dead. But he looked normal, didn't disfigure him or anything. There were guys there with their heads gone, and their legs, and arms. And just some awful injuries. Another guy who had his head taken off - we pulled his body out from under all this wreckage and he has no head. So that was a shock. Somebody looked around and found the head, and put it with him. But it didn't matter whether you were out on the topside or whether you were inside. When one of those kamikazes hit, why, it did so much damage it killed just as many guys inside as outside. That same one that hit us that night, why, those guys in the forward fire room, those engines ran off of superheated steam, and by superheated I don't know what the temperature is, but it was awful hot. Well, I guess the one hatch on the port side evidently got buckled or something, they couldn't get out. So what they did, they come up through the hatch on the starboard side and the shrapnel had punctured the main steam line and they had to come right through that jet of steam. It just cooked them alive. There were several dead, just fell down to the bottom of the ladder. But three of them got through the steam and got out. I saw them later; they were running around and they were cooked alive. It actually cooked them just like a pressure cooker. It cooked the color out of their skin. And the skin, if you grabbed them would come off. Because I saw them later, they had them lying on stretchers, they shot them full of morphine. Where they had taken hold of them, the skin was coming off them. Besides the two crashes of kamikaze aircraft into Cassin Young, the destroyer also was involved with other destroyers that sank after being hit by kamikazes. On April 6, 1945, Cassin Young fired upon three enemy planes and downed one. Later at 1900 on the same date, the ship arrived at Radar Picket Station 1 to aid the surviving crewmen of the destroyer Bush (DD-529), sunk by suicide planes, and the destroyer Colhoun (DD-801), also hit by several kamikaze aircraft. Cassin Young took aboard about 200 men from the sinking Calhoun, and in the middle of the night Cassin Young’s captain carried out orders to fire upon Colhoun and sink her since the flooding and fires could not be controlled. In the early morning hours of July 29, 1945, a slow, low flying kamikaze plane hit and sank the destroyer Callaghan (DD-792) at Radar Picket Station 9A. Cassin Young fought off other incoming planes while the destroyer Pritchett (DD-561) went to Callaghan to take off survivors before the ship sank. Cassin Young also brought aboard over 120 Callaghan survivors. References to Japanese kamikaze pilots and Special Attack Corps operations to carry out suicide attacks contain several factual errors. For example, the last paragraph of Chapter 3 states that “the Japanese became desperate and ramped up their kamikaze attacks” as the Americans closed in after the fall of Okinawa in late June 1945 (p. 86). The Japanese did continue kamikaze attacks until the end of the war in August 1945 but only sporadically at a greatly reduced rate in comparison to the mass kamikaze attacks during the Battle of Okinawa from April to June 1945. The author incorrectly states that a Japanese midget submarine sneaked into the Ulithi harbor and torpedoed the oiler Mississinewa on November 20, 1944, when Cassin Young was there (p. 67). Actually, a regular I-class submarine launched five kaiten human torpedoes in suicide attacks at Ulithi, and one kaiten loaded with explosives hit and sank Mississinewa. The Prologue inaccurately describes the kamikaze attack on Cassin Young on July 30, 1945, as the last kamikaze attack of the Second World War (p. 7). 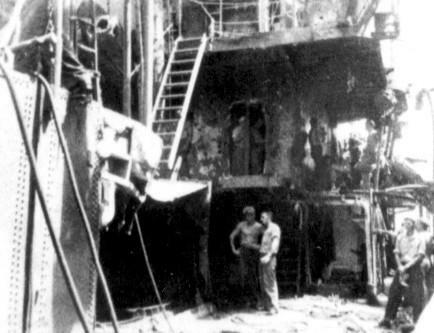 Several more kamikaze attacks took place after this date up to the end of the war on August 15, such as the one on August 9 that hit the destroyer Borie (DD-704) with 48 killed and 66 wounded and the one on August 13 that hit the attack transport Lagrange (APA-124) with 21 killed and 89 wounded (Rielly 2010, 324). In three pages that describe battle operations of Cassin Young between April and June 1944, there are three references to kamikaze pilots even though the Japanese Navy’s Kamikaze Special Attack Corps did not get formed until October 1944 (pp. 49-51). These inappropriate references seem to be the result of the author’s placing quotations and a photograph in the wrong place in the ship’s history.